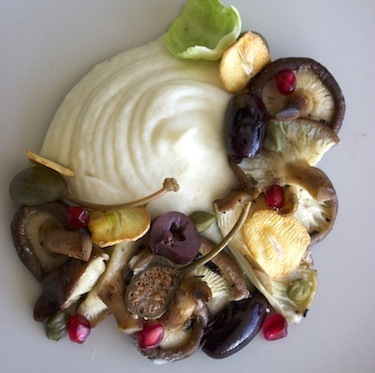 Celeriac Mash made with coconut milk, paired with wild mushrooms! Peel and dice celery root in small cubes. Combine celery root, garlic clove and coconut milk in a saucepan. Bring it to boil and reduce the heat. Simmer until the celery root is tender, about 30 minutes. Transfer celery root and liquid to blender, make smooth purée. Season with salt. Heat olive oil in a large saucepan. Add the mushrooms and let them cook on high heat for 4-5 minutes until they start caramelizing. Now add olives, herbs, capers, garlic, red pepper flakes, salt, pepper and mix them well and cook for another 1-2 minutes. Love celery root. So ugly (lol) and yet so versatile. Try it grated in your cole sales. Adds a lovely layer of flavours.